A decade ago, I applied for a work visa in Britain and used it to work and travel for several months. This is that story. To begin at the beginning, go here. You can pick up a hard copy here or download the PDF here. As our vessel pulled into the Bodrum harbor, we were told we could not dock because our ship was too large. We needed a tender to bring us to port. But we couldn’t use our on-board tender because only Turkish tenders were allowed ashore. But we couldn't use a Turkish tender because…they didn’t have one. So it was decided that we would be allowed to put a Turkish flag on our own tender and proceed to the coast. Security for tourists in Turkey was world-class. I never felt safer abroad than when I was in Turkey. In previous ports, we would walk off our boat without a security check and immediately go about our business. In Turkey, we flashed our security badges to the border guards at the harbor, then walked past a stern crew of Turkish police looking for anybody acting suspicious near the border checkpoint. It appeared they had learned some hard lessons and were not about to make those mistakes again. Once safely in the country, we were introduced to a fortified city constructed by the Knights of St. John’s. There was a beautiful aquatic museum full of artifacts discovered off the Bodrum coast. We walked through towers inside the city walls decked out as they might have been in the 16th century. 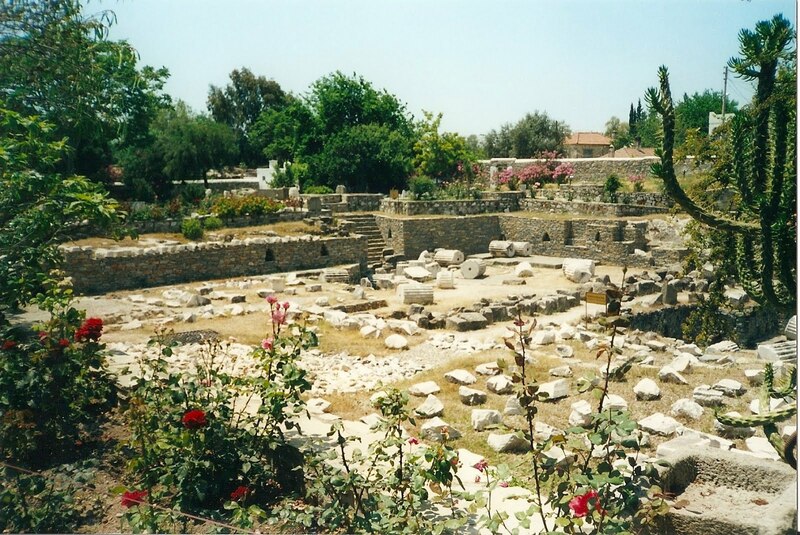 One of the main attractions in Bodrum was the Mausoleum, an Ancient Wonder of the World. We set out for it and, after wandering uphill through many rundown apartments and tight alleys, found the site. There were some pictures of what the Mausoleum could have looked like and we walked among what must have been its basement or possibly some underground parking. Our self-guided rubble-walk did not take very long so we had time to check out the next-largest icon on our tourist map, an ancient Roman theater. There were very few signs leading us to the Mausoleum and absolutely nothing guiding us to the theater. Even so, we eventually found our site half a mile away, on the far side of a highway bordering the outskirts of Bodrum. There was only one person there, a rough-looking gentleman who asked us over and over again if he could take our picture. Perhaps he was hoping we would mistake him for some sort of official keeper of the ruins or picture-taker extraordinaire, but we ignored him and walked around on our own. The theater was nicely intact and not too overgrown. We walked to the top row of seating to enjoy a nice view over the highway, down toward Bodrum’s shores. Once we were back into the middle of homes and apartments, we started to hear music that sounded like it might have been coming from somebody’s car. To my untrained ears, it was a haunting sound. As we walked deeper into town, it grew stronger. As the sound became louder and louder, so did my run-and-hide instinct. But nobody on the street seemed to be panicking. Either there was nothing at all to worry about or there was something extremely horrible to worry about. I KNEW Turkey would be exciting! Finally we came upon it. It was not a stereo or a car at all, but a speaker in a minaret tower. It was prayer time. Relieved, but also fearful that we were trouncing all over local customs by walking the streets during prayer, we proceeded cautiously towards the city. After a few more nervous minutes, we stumbled on Bodrum’s main street and saw other people milling about as though this sort of thing happened five times every day and only a clueless traveler would have an ounce of concern. We stopped in for a bite to eat at a shore-side café and found some very helpful Turks who told us which dolmuş to take to get to the most beautiful beaches. We thanked them and jumped on the first ride that came by. A dolmuş was a combination bus and taxi. I’m still not sure if they had defined routes. Our driver took requests pretty regularly, heading off in bizarre directions whenever someone shouted out something new. I never saw a dolmuş station or a dolmuş stop. We picked up people along the way wherever we found them. Despite all this, the dolmuş system worked remarkably well. We were at our destination quickly, despite a significant language barrier, no route schedule, and some very vague instructions. Our destination for the afternoon was the sandy shore of Barlacki Beach in front of a magnificent hotel. The beach was full of European tourists and we had to pay a small fee to the hotel for the privilege of sitting on the sand with them, but it worked out well. For our sitting fee, we received a towel and an umbrella and had access to the softest white sand on which I have ever set foot. Perched at the bottom of a barren hillside dotted with round green bushes, the beach bordered perfectly clear, deep blue water, the kind one sees on Caribbean vacation post cards. The sea bottom was as soft as the shore and sloped so gradually that we could wade endlessly before needing to tread water. We had a fabulous afternoon in the sun and surf before walking back into town, past several more hotels and a fenced-off military facility that seemed perfectly located to remind tourists to keep their guard up. After a queasy night on choppy seas, we woke in Kusadasi. There was very little to do in Kusadasi. 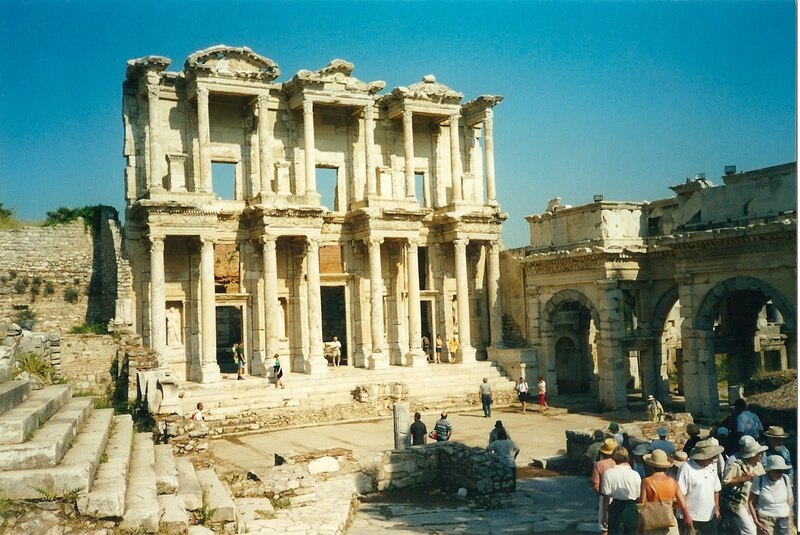 However, Kusadasi was very close to the biblical city of Ephesus. Tour companies loved this because they could list “Kusadasi/Ephesus” as a destination on their cruise but charge extra for add-on tours of Ephesus. Despite this apparent scheme we decided to take the tour, abandoning Kusadasi and its many newsstands and suitcase vendors. The tour bus came to pick us up and we were greeted by a phenomenally talented tour guide. He was – and I believed him about this – part time tour guide, part time Turkish ambassador to Russia. Apparently if you are extremely bright and you want to make a lot of money in Turkey, you go into tourism. His English, one of many languages he spoke, was flawless. During the ride he told us about the history of Ephesus, its significance as a Mediterranean port during the biblical era, and how it filled in with silt, which killed the town as the coast moved out to Kusadasi. The marble ruins of Ephesus were intact, set in a field of straw grass at the base of several barren foothills. The main street, which sloped down toward the former seashore, was bordered on one side by ancient market stalls where silversmiths once hawked trinkets of Roman gods. Along the opposite side there was a stone foundation and stalls for a co-ed (yes, co-ed) bathroom. At the base of this street sat a towering room that housed the Ephesian Library. 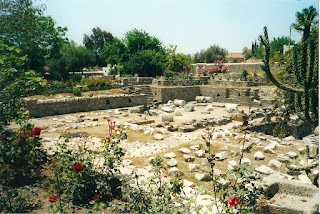 To the right of the library, down a short road, lay a fantastically large, acoustically perfect open-air theater where the Apostle Paul was famously scheduled to preach before being run out of town. Our day in Ephesus was hot and there was little shade. We were happy to board the bus and return to the cooler coast, but Ephesus was well worth the trip. I had goose bumps walking through those ancient roads, the same ones my Sunday school teachers once tried in vain to make me appreciate. After returning to Kusadasi, we got our first taste of Turkish salesmanship. The bus dropped us off at a rug store where we were taken downstairs and treated to a well-choreographed display of fast talking and rug throwing. As the salesman described one rug after another and fed us apple tea, his assistants grabbed rugs that were scattered strategically in large piles throughout the room and flung them before us. The rugs floated in the air for an unnaturally long period, then fell in a dazzling array of bright colors and patterns on the floor. Several of the rugs were sewn with a unique thread that made the fabric appear to change hues as it moved through the air. I muscled together a mountain of self control and we walked away empty-handed. But the seed was sown. Few tourists left Turkey without a rug. Now we knew why. The next morning, our cruise ended in Istanbul. We were back in the cold, cruel world and it was a bit of a shock. We had grown accustomed to a life of luxury and spent a few disoriented minutes trying to get our travel brains back. We dug out a map, spun it a few times, took our best directional guess, and marched off across a bridge over the Bosporus Strait. Our first stop was the Blue Mosque, a very large, appropriately named, blue mosque. The mosque sat in the middle of an elaborate garden, full of knee-high hedges and bright flowers. Because it was still a functioning mosque there was no entrance fee, so we walked right in. I had never been inside a mosque in my life, so my primary goal was to avoid offending someone. Fortunately, there were plenty of other tourists milling about, staring at the walls. Four very large “Elephant’s Feet” pillars supported the dome. The walls were covered with thousands of hand-made blue floral-patterned tiles. The entire floor, except for a roped-off tourist area, was reserved for prayer space and was covered with prayer rugs. On the eastern wall was a small staircase leading to an elevated podium where the imam would lead the prayer service. After a trek through Hagia Sofya nearby, we headed to the Basilica Cisterna, which our guidebook listed as a “must see.” By that point, I was skeptical of anything our guidebook said, but the Basilica was close by and we couldn’t think of a better option. It turned out to be a very good decision. We entered on ground level and took five flights of stairs down below the surface. At the base of the steps, we stood at the entrance of a perfectly preserved Roman temple. As our guidebook told us, the temple had sunk into the ground over the past few centuries, leaving it completely buried. A bit of careful digging exposed the original structure but the floor remained covered under a few inches of water. High above, the ceiling dripped steadily. Every pillar was preserved intact - thirty feet high, two feet wide, and meticulously aligned in perfect rows. For once, our guidebook was right. We walked in awe through the ancient pathways, able to appreciate the beauty of Roman architecture in a way that roofless ruins could never inspire. Wincing as we stepped back into daylight, we strolled to the Grand Bazaar, a market that redefined high-pressure sales. 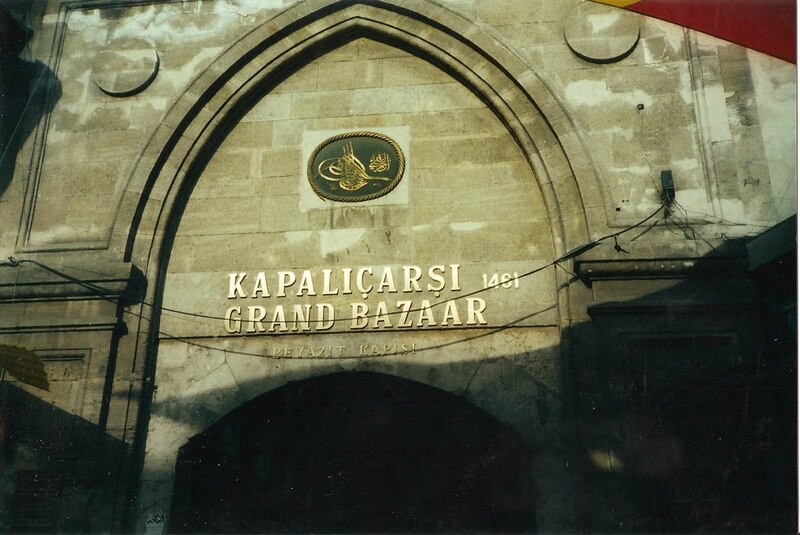 For such a loud, chaotic, fantastic place, the Bazaar barely announced itself from the street. 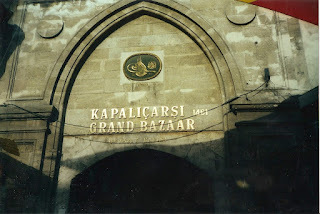 Nestled amongst ordinary shops and offices were several innocuous doorways marked “The Grand Bazaar.” Inside lived a circus of noise and glitz. Throngs of salesmen and customers engaged in perpetual, animated negotiation. The air smelled of spices, dust, and sweat. A haze hung throughout, adding to the sense of excitement and mystery. Most stores offered jewelry, handcrafts, or rugs, all without a price tag. Buyer, beware. Somewhere in this crazed arena - we were sure - lived a rug just for us. We walked past several shops, avoiding eye contact with the shopkeepers as we tried to gain confidence. Summoning an extra ounce of courage, we engaged one of the salesmen and were whisked inside to a private room. Apple tea arrived immediately. Just as we saw in Kusadasi, a pair of assistants flung rugs in front of us while the head salesman watched eagerly. When we saw one we liked, the assistants stepped to the side and the salesman sat down beside us to discuss price. He gave us - in my opinion - a very high starting price, which we countered with a ridiculously low price. The gap seemed insurmountable, hundreds of dollars, but we whittled away our differences until I could not whittle any more. The salesman sighed, sat back, and told us we could have a few minutes to think. Karie and I sat in confused silence while he looked off in the distance. After an awkward eternity, we told him we were at our limit. The salesman asked for our final price. We repeated our bid. He asked for our final, final price. We repeated ourselves again. Convinced that we might be serious, he asked us what our occupation was. I thought for a minute and replied “students.” I think I actually felt his eyes roll. All hope of finding a final, final, final price gone, he agreed to give us our rug. The next few minutes were a blur as his assistants magically reappeared and dove into a frenzy of rug rolling and wrapping. Our salesman ran - literally ran - with us to the cash machine so we could pay him. We returned, received our rug, and were ushered out the door with encouragements to tell our friends. I have no idea if we got a great deal or not. Price tags, the crutches I depend on to know the value of an object, do not exist in the Grand Bazaar. What I do know is that I love our rug, in part because of how exciting it was to purchase it. Wal-Mart will never, ever be able to provide that thrill, no matter how many rolls of toilet paper they fit inside a single package. Confused and riding on a little too much bargaining adrenaline, we wandered aimlessly around Istanbul, managing to get ourselves very, very lost. We walked into a dingy internet café to get our bearings. The computer I selected did not work. I mentioned this to the clerk and got an angry glare from him and several people sitting near him. It was possible that he and his friends always looked angry, or preferred not to speak English. Whatever the case, I did not want to push it. I had my rug. I did not need a working computer, especially if it meant dealing with potentially cranky customer service personnel. Karie and I packed up and left, trying to avoid their stares. The next day, we stumbled on a series of vocally gifted street vendors, one of whom continuously yelled “KEBAB KEBAB KEBAB KEBAB KEBAB!!!!!!!! !” Impressed, I bought a meatball sandwich from him. It was undoubtedly the most severely undercooked meatball sandwich in all of Istanbul. At that moment, I vowed never again to base my purchase decisions on lung strength. That night, we decided to check out a Turkish bath, under the misguided assumption that Turks, like the rest of the world, prefer bath time to be a relaxing experience. At the bath house, I was quickly whisked away to the men’s bath, Karie to the women’s. From there, I was escorted by a very large, very rough man to the changing room, then the sauna, then given the hot bath, then the vicious scrubbing, then the vigorous massage, then the cold bath, then taken back to the sauna, then the shower, then left on my own for the drying and re-dressing. I’m not sure how long it all took. It was thoroughly cleansing, but it was by far the most brutal bath beating I have ever had. I think I’m still sore. Also, it cost me 28 million lira. I refused to do the math and figure out how many dollars that was. I was just proud I could afford 28 million of anything. We returned to the Blue Mosque at ten o'clock that night to take in a prayer service. We were a bit nervous. In theory, we were welcome to view the prayer service, but it was dark, we had never done this before, we were completely unfamiliar with local customs, and deep in the back of our minds we knew that we were Americans and at least a few people in this part of the world despised us because of that. We made our way through the darkened streets of Istanbul, past the gardens of the Blue Mosque, and up to the entrance. Quietly and slowly, we neared the doorway, our traveler-sense on high alert. Just as we poked our heads in the mosque to see if the coast was clear, we were stopped by an attendant. Expecting the worst, we were amazed when he graciously invited us inside. Even though we were clearly outsiders, he seemed eager to let us watch the service. I was floored, though I should not have been. By this time, I should have put the pieces together. Of all the people in all the countries we visited, Turkey held the kindest and most outgoing. This realization dawned on me as I walked inside the gigantic blue dome and listened to the enchanting sound of the evening prayer. The service was simple. Worshippers kneeled and bowed on individual rugs while the muezzin sang and chanted prayers out of the minaret. After several minutes, we let ourselves back out into the cool nighttime air. We got up early in the morning and took a shuttle to Ataturk International Airport, one of the most tidy, modern, and secure airports I have ever been in. We made our way through four security checkpoints before boarding a brand new Boeing 737. The flight was perfectly smooth. Onboard, we were offered a wide selection of international newspapers and fed a delicious meal. If you get tired of reading miserable news from the Middle East or you want a wonderful urban vacation, put Istanbul high on your list of destinations. You will not regret it. Hi, I'm Drew Johnson. I live in St. Paul, Minnesota with my wonderful wife and three perfect but insane children. During most days, I write software. Enjoy your time here and feel free to contact me at drew@drewyaks.com.